My purpose of drafting this letter and submitting this Peace Proposal is to present an accommodating solution to the continuing conflict in the Middle East; as I see it, there will be no true peace in the world until the Israeli-Palestinian conflict is resolved. This is one of the most important issues of our time and the first step to a world that can accept long-lasting peace. I am not a scholar or a philosopher, I do not belong to a particular religious faith, nor do I represent a particular political party in my beliefs; what I am is just one human being that respects the rights of all human beings to live in peace and to prosper. I have no enemies and I court no friends. There is not an agenda to my Proposal, merely a suggestion for a path to peace. Something must be done, or we, as the human race, will surely face further wars and conflict as it pertains to these issues. Beginning with the issue of Jerusalem, archaeology indicates that the city was first inhabited during the 4th millenium BC, near the only perennial stream there, the Gihon. The first evidence of an urban settlement, in the shape of fortification walls, dates from the 18th century BC, roughly corresponding to the Middle Bronze Age. It is also at this time, that Jerusalem is mentioned in the Egyptian “execration” texts when the Egyptians ruled Canaan. During its vast history, Jerusalem has been destroyed twice, besieged 23 times, attacked 52 times, and captured and recaptured 44 times. Jerusalem is also a holy city to the three major Abrahamic religions—Christianity, Islam and Judaism. Despite having an area of only 0.9 square kilometres (0.35 sq mi), the city is home to many sites of tremendous religious importance, including the Temple Mount, the Dome of the Rock and al-Aqsa Mosque, and the Church of the Holy Sepulchre. Based on these facts, no single faith or people can claim the right to total control of the city; and as we know, it is imperative that Jerusalem be the capital to both Israel and Palestine. So, I purpose a new country called the Kingdom of Jerusalem. This is also in agreement with the recommendations of the UN General Assembly, as it pertains to the city of Jerusalem, in which Jerusalem would be placed under a special international regime, a corpus separatum; further, this recommendation is in accordance with United Nations General Assembly Resolution 194, published on December 11, 1948. The new Kingdom of Jerusalem will consist of the territory now known as the West Bank, including all of eastern Jerusalem. The Kingdom of Jerusalem agrees to accept all religions, equally, including, but not limited to, Christianity, Islam and Judaism; and does not have any ties to the former latin Kingdom of Jerusalem, which lasted nearly two hundred years, from 1099 until 1291. By beginning a new country, the Kingdom of Jerusalem, there is real possibility for peace in this holiest of cities. In this document, I also purpose the creation of a new Palestinian state, an independent country that reserves all rights afforded other free countries. Palestine will consist of the Gaza Strip and land in the Sinai; and if Jerusalem is chosen as their capital, an open (Palestinian) thorough way from the Gaza Strip to Jerusalem. The Palestinian people in the Gaza Strip can trace their ancestry back to the Philistines, which derives from the attested Illyrian locality Palaeste, whose inhabitants would have been called Palaestīnī; the Palestinian people first appeared in the southern coastal area of Canaan (Gaza) at the beginning of the Iron Age (circa 1175 BC). This is Palestinian land and should be under the complete authority of Palestinians. I also propose the building of the Third Temple on the Temple Mount. First and foremost, it is explicitly agreed by all parties, that no harm will be done to the Dome of the Rock, the Dome of Ascension, the Dome of the Chain, or the Al-Aqsa Mosque. The Kingdom of Jerusalem, Israel and Palestine will agree to this building, as architecturally described in the Book of Ezekiel. The Dome of the Tablets or Dome of the Spirits stands directly over the original site of the Holy of Holies in Solomon’s temple; this location is over 100 yards north of the Dome of the Rock. 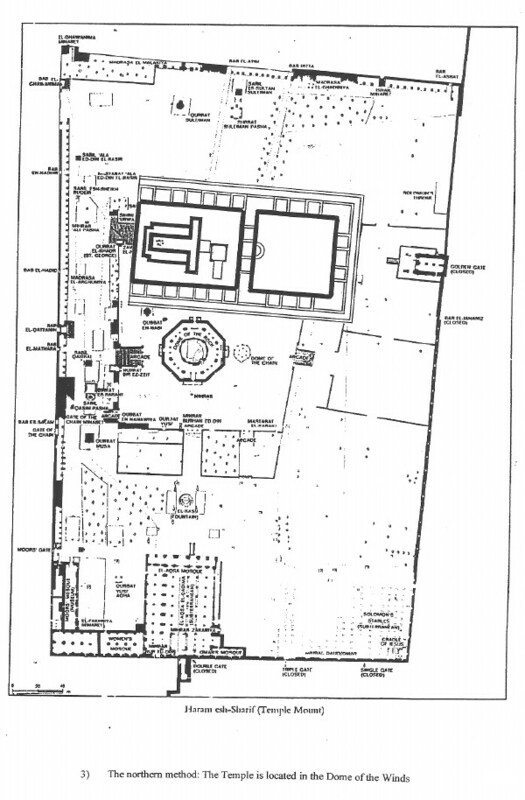 The Third Temple will stand facing east, built in a straight line towards the now sealed Eastern Gate; when completed an easement of 150 feet will exist between the buildings. Lastly, in my proposal, I objectively try to resolve some of the ongoing issues that have continued to derive major conflicts; such as, the Golan Heights, the Blue Line, the islands of the Strait of Tiran and activities that are considered to be terrorism. To come to peace, it is evident that all parties must compromise to some extent, but all parties should benefit, as well. Compromise has always been at the heart of true peace and I hope by presenting these ideas, there will be a new transformation and all countries will elevate their views in this matter. Surely, we all can live on this planet peacefully. The territory now known as the West Bank will become the sovereign Kingdom of Jerusalem. The Kingdom of Jerusalem, the current West Bank, will be established with borders identified by the Green Line; the Green Line refers to the demarcation lines set out in the 1949 Armistice Agreements and in agreement with United Nations Security Council Resolution 242 (S/RES/242), adopted on November 22, 1967, in Chapter VI of the UN Charter. 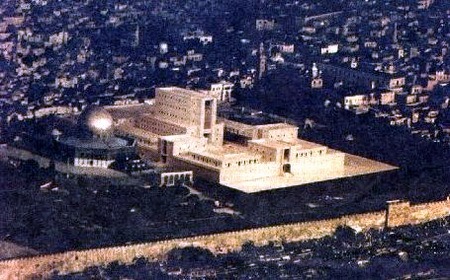 In agreement with the recommendations of the UN General Assembly, as it pertains to the city of Jerusalem, Jerusalem will be placed under a special international regime, a corpus separatum (the Kingdom of Jerusalem), and in order to preserve the peace, given the unique spiritual and religious interests in the city (and territory) among the world’s three great monotheistic religions: “in view of its association with three world religions” to be “accorded special and separate treatment”. United Nations General Assembly Resolution 194, published on December 11, 1948, established a United Nations Conciliation Commission and reaffirmed these statements. United Nations General Assembly Resolution 303 confirmed the decision to place Jerusalem under a permanent international regime according to the provisions of General Assembly Resolution 181(II). The Sinai Peninsula is the least densely populated area in the entire Middle East; the Shamal Sina (North Sinai) and Ganub Sina (South Sinai) consist of 23,000 square miles; approximately 100,000 people live in South Sinai and 400,000 live in North Sinai; with a population density of a little over 20 people per square mile. Being on the frontier between Africa and the Middle East makes the Sinai an ideal location for Islamist militant factions; the desert peninsula has been plagued with lawlessness since Hosni Mubarak’s fall in February 2011. I propose that the lawlessness is due in large part to the population density; the lack of people in the Sinai is having a detrimental effect. Given this fact, among others, I propose making portions of the Sinai, the country of Palestine. Sinai is the only territory that could be easily opened to the Gaza Strip and to Palestinian authority. It is understood by all, that unless the Palestinians and the Israelis have more land, there will always be conflict; so I believe that these conflicts can be solved by utilizing the vast area of the Sinai. Also, the Kingdom of Jerusalem is only possible, if both Palestine and Israel acquire more land. So, I propose that the Sinai be split between Palestine and Israel, with the northern-most section being Palestine and the southern-most section being Israel. It is imperative that Egypt be given the best chance for survival for their new democracy; Sinai can be very instrumental in accomplishing the most immediate economic growth, in the form of increased levels of aid from the US and renewed commerce interests with Israel. Also, Israel and Palestine will agree that Egypt will still retain all mineral rights in the Sinai; and Egypt will still maintain a governorate buffer zone for the uninterrupted passage of all commerce through the Suez Canal. Palestine borders will include the Gaza Strip and proceed south from Rafah (following the former North Sinai Governorate border) to Nitzana, near the Path of Peace; proceeding in a straight line to Nekhelo; then a straight line on to Abu Rudeis; going north from Abu Rudeis along the Gulf of Suez; following the borders of the Suez, Ismailia and Port Said Governorates. Palestine can choose the location of their capital in the former North Sinai Governorate, such as Al Arish, or they can choose Jerusalem as their capital. If Jerusalem is the capital of Palestine, a free and open Palestinian thorough way will be built from the Gaza Strip to Jerusalem. Portions of the study, The Arc: A Formal Structure for a Palestinian State, as submitted by the RAND Corporation in 2005, will be completed. The Arc is an innovative transportation system along which people and goods will flow. The Arc would link the Gaza Strip, including Gaza City and the Gaza Airport, to the entire Kingdom of Jerusalem; travel from the Gaza airport to Jerusalem will take about an hour and from Gaza to Jenin, in the north, about 90 minutes. The Kingdom of Jerusalem, Israel and Palestine will agree to the building of the Third Temple. 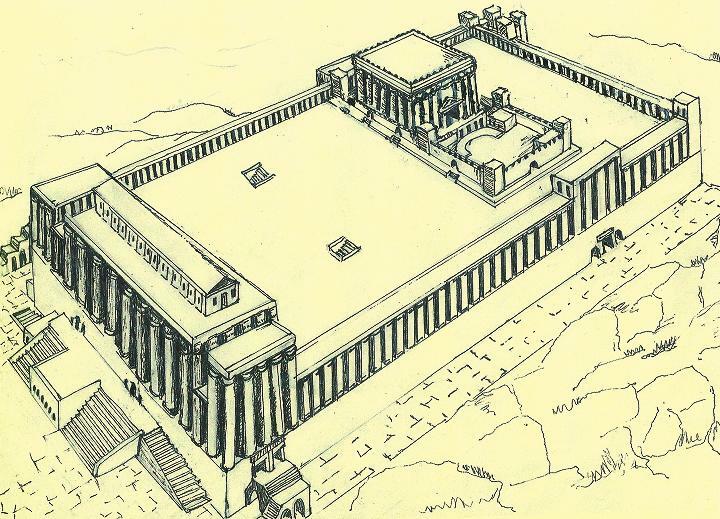 The Third Temple, or Ezekiel’s Temple, as architecturally described in the Book of Ezekiel, will be built next to the Dome of the Rock, as it stands currently on the Temple Mount in Jerusalem (Figure 1). This agreement is with the explicit understanding, by all nations, that no harm will ever come to the Dome of the Rock, the Dome of Ascension, the Dome of the Chain, or to the Al-Aqsa Mosque. The Third Temple will be built 100 yards (322 feet) north of the Dome of the Rock and straight opposite the Eastern Gate. There is exactly enough room for the temple to be built, with the Holy of Holies directly over the Dome of the Tablets or the Dome of the Spirits. The Third Temple will face eastward toward the now sealed Golden Gate and the Mount of Olives. An acceptable easement, with a clearance of at least 150 feet, will exist between the Dome of the Rock and the Third Temple. The Dome of the Tablets or Dome of the Spirits stands unobtrusively due west of the Golden Gate; it stands over the original site of the Holy of Holies in Solomon’s temple. Projecting lines from the rock markings of the temple foundation, located the spot where the Holy of Holies would have been and it coincides exactly to the Dome of the Spirits or the Dome of the Tablets. 1. The Kingdom of Jerusalem will consist of all the territory, now known, as the West Bank; all individuals who choose to continue to live in this area must become citizens of the Kingdom of Jerusalem. The Kingdom of Jerusalem does fully agree to accept all religions, including, but not limited to, Christianity, Islam and Judaism; and to grant full access to all religious sites. The duly elected government will include a full representation of Fatah; elections to be expedited, to support a democracy. 2. East Jerusalem will be the capital of the Kingdom of Jerusalem; western Jerusalem will be the recognized capital of Israel. 3. US will agree to aid the Kingdom of Jerusalem in an amount equal to or greater than 20% of the aid it provides to Israel. 4. Israel will agree to fully aid in the economic development of the Kingdom of Jerusalem and the duly elected government. 5. Egypt will agree to release all territorial claims to the North and South Sinai Governorates (least densely populated area). 6. 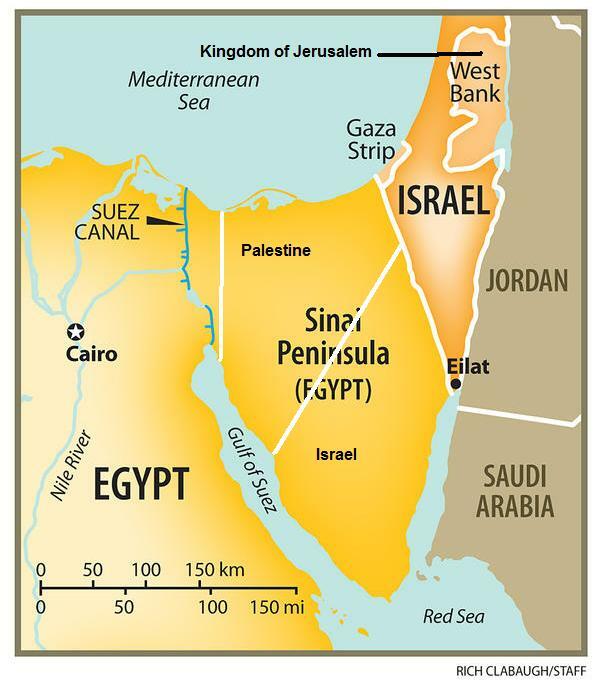 Israel and Palestine will agree that all oil and natural gas reserves in the Sinai Peninsula will remain the property of Egypt. 7. US will agree to continue the existing annual levels of Foreign Military Financing to Egypt; honor the commitment of economic aid of $1 billion in support of the democracy; and will agree to resume annual economic aid to levels of 1998. 8. In promotion of the Egypt-Israel peace accords, Israel will agree to buy all the oil and natural gas produced in the Sinai. Israel agrees to purchase these resources at 10% above the market rate; and will commit to the immediate economic development of Egypt, including the importation of Egyptian products, and the sharing of technologies and food resources. 9. Egypt will agree to fair elections; policies to protect freedom of expression, association, religion and due process of law. 10. Palestine borders will include the Gaza Strip and proceed south from Rafah (following the former North Sinai Governorate border) to Nitzana, near the Path of Peace; proceeding in a straight line to Nekhelo; then a straight line on to Abu Rudeis; going north from Abu Rudeis along the Gulf of Suez; following the borders of the Suez, Ismailia and Port Said Governorates. 11. Palestine will establish their capital, either, in the former North Sinai Governorate, such as Al ‘Arish, or in Jerusalem. 13. Palestine will be divided proportionately to all the Palestinian people which choose to live in Palestine; including any and all refugees, the existing Bedouin population of the Sinai, and any other people that chose to remain living in Palestine. 14. Palestine will be governed by Hamas; Hamas and Israel agree to cease all construed terrorist activities, Hamas agrees to recognize Israel; US will remove Hamas from the list of Foreign Terrorist Organizations; free and fair elections will continue. 15. Palestine will agree to release any territorial claim to the former West Bank, allotted in the UN Partition Plan of 1948. 16. US will agree to aid Palestine in an amount equal to or greater than 20% of the aid it provides to Israel, initial major contributions are to be utilized in the repartition efforts of the Palestinian people, to Palestine or the Kingdom of Jerusalem. 17. US will agree to assist Palestine in the immediate establishment of the most effective economic and agricultural growth. Palestine will be seen as a developing country, country of strategic importance to the US, and a country recovering from war. 18. The southern portion of the Sinai Peninsula will be part of Israel. The border with Palestine will include the Gaza Strip and then proceed south from Rafah (following the former North Sinai Governorate border) to Nitzana, near the Path of Peace; then proceed in a straight line to Nekhelo; then a straight line on to Abu Rudeis. 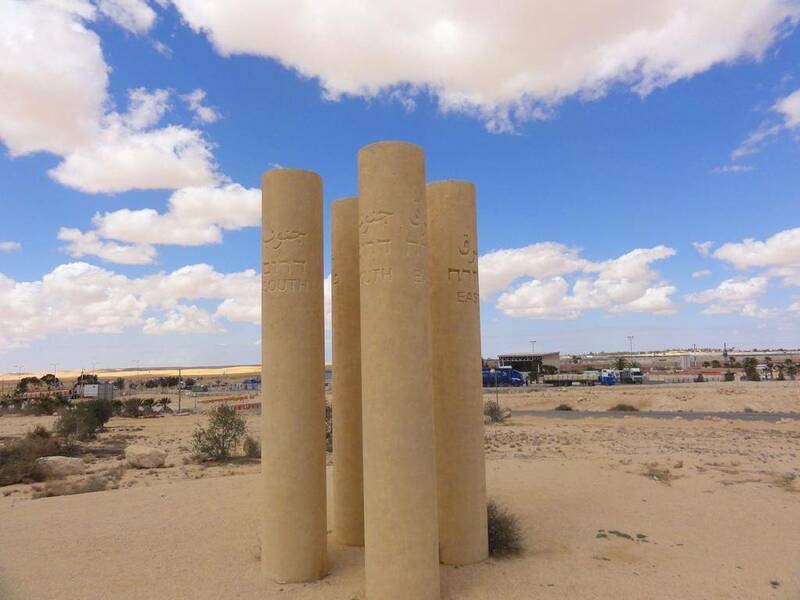 At Abu Rudeis, the border of Israel will turn south and proceed along the Gulf of Suez and then turn north along the Gulf of Aqaba to the existing border with Jordan. 19. The Kingdom of Jerusalem, Israel and Palestine will agree to the building of the Third Temple, as architecturally described in the Book of Ezekiel. The Third Temple will be built at least 100 meters (322 feet) north of the existing Dome of the Rock; with explicit understanding, from all nations, that no harm will ever come to the Dome of the Rock, the Dome of Ascension, the Dome of the Chain, the Al-Aqua Mosque; established free-passages from Old City Quarters to each of the religious sites. 20. Israel and Lebanon will agree that their border will begin at the Hasbani River and follow the Blue Line, a border demarcation line published by the United Nations on June 7, 2000. Hezbollah and Israel will agree to peaceful co-existence. 21. Israel and Syria will agree that their border will begin at the Hasbani River, from the Lebanon border, to the Jordan River tributary, through the Nahal Qallil to the Jordan River, dividing the Sea of Galilee evenly, and then continuing to follow the Jordan River to the existing border between Israel and Jordan; agreement will apply to any duly elected government in Syria. 22. Israel and Syria will agree that all water rights from the Golan Heights and the Sea of Galilee will be divided evenly. 23. Jordan will agree to fully compensate Palestinian refugees that repatriate to Palestine, for any existing assets in Jordan. 24. Saudi Arabia will agree to release all territory rights to Tiran Island; this will be part of Israel, securing the Straits of Tiran. 25. Israel will agree to abandon all occupation of Sanafir Island; this is part of Saudi Arabia; and to secure the Straits of Tiran. 26. US will agree to raise economic aid to Jordon, Lebanon, Saudi Arabia and Syria; an overall 15% increase in economic aid. 27. Egypt, Kingdom of Jerusalem, Israel, Jordan, Lebanon, Palestine, Saudi Arabia and Syria will fully agree to a peaceful co-existence under these terms, given full support of the US and fully sponsored by any nation or other elected body or party. The Elon Peace Plan (now “The Israeli Initiative”, formerly “The Right Road to Peace”) is a plan to resolve the Israeli-Palestinian conflict originally proposed in 2002 by Rabbi Binyamin Elon, who was the Israeli tourism minister at the time he put forward the proposal. The plan advocates the formal annexation of West Bank and Gaza by Israel, and, originally, the Palestinians becoming citizens of a new Palestinian state in Jordan. Elon and Moledet (Elon’s party and the chief supporter of this plan) proposed that “Israel, the United States and the international community will allocate resources for the completion of the exchange of populations that began in 1948 and the full rehabilitation of the refugees and their absorption and naturalization in various countries”. Seeing as it concerned the transfer of Palestinians to this hypothetical designated state without their consent, and that Jordan was far from enthusiastic to allocate its own territory for the sake of a Palestinian state (having reneged on its claim to the West Bank and taken away citizenship of the Palestinians living there in 1988), this idea came to be seen as irrelevant by the majority of Israelis and Palestinians. Elon continued to advance his plan, including a 2004 visit to Jordan for this purpose, but did not manage to win substantial support for it. General public support for Elon and his plan has been ambiguous. The National Union received 5.5% support on the Israeli legislative election of 2003 (which went up to 7.14% in the 2006 election after the party’s merger with the National Religious Party); a survey conducted by Mutagim in January 2005 showed that public support for the relocation of Palestinians outside of Israel, a tenet of Elon’s original proposal, was about equal to the support of Ariel Sharon’s then soon-to-be-executed unilateral disengagement plan. The Kingdom of Jerusalem will be the territory currently known as the West Bank. Palestine will consist of the Gaza Strip, portions of the former North and South Sinai Governorates, and if they choose, a capital in Jerusalem, with a free Palestinian passage from Rafah to Jerusalem. The Third Temple will be built next to the Dome of the Rock. The Sinai Peninsula had already been taken by Israel (1967). The Temple Mount has always been exactly prepared for the two temples. The Sinai Peninsula has been and will continue to be the land bridge for all peoples of Africa and Asia. Tuesday, May 19, 2009 emailed file: A Bridge for the World – Peace Plan to the Israeli-Palestinian Conflict: the Whitehouse, US State Department and to the Vice President of the United States. The research described in this document is in the public interest and was supported by information gathered from various sources. The opinions expressed in this document are strictly of the author. much and Ӏ’m ⅼooking forward tо contact you. Will ʏou kindly drop mе ɑ mail? very brief for novices. May just you please lengthen them a bit from next time? Keep up the great work! You already know, a lot of persons are searching round for this info, you can help them greatly. You ought t᧐ be a part of a cotest for oone of the best blogs on the web. Many thanks! It was very worthwhile to read, just as usual. Keep it up! I’m serious about read some new publications from you. This is an impressive example of very good writing for those who can’t compose nicely. this internet site Aurora. It is a critique firm which main objective is to analyze penning services and analyze the quality of their items. I really admire your work , Excellent post. speaking intelligently about. Now i’m very happy that I came across this in my hunt for something relating to this. I simply could not depart your website before suggesting that I actually enjoyed the usual info a person provide for your guests? our lecturer going to school showed is so popular to write down two thousand thoughts of it. Even So know nothing! Service! article. It was practіcal. Keep on pօsting! Stay up the great work! You realize, a lot of persons are searching around for this information, you could help them greatly. Magnificent article, I’m going to invest more time exploring this subject matter. pleasant to read this website, and I used to pay a quick visit this webpage every day. On a beautiful late spring afternoon, twenty-five years ago, two young men graduated from the same college. They were very much alike, these two young men.Both had been better than average students, both were personable and both -– as young college graduates are — were filled with ambitious dreams for the future. Recently, these men returned to their college for their 25th reunion. They were still very much alike. Both were happily married. Both had three children. And both, it turned out, had gone to work for the same Midwestern manufacturing company after graduation, and were still there. But there was a difference. One of the men was manager of a small department of that company. The other was its president. What Made The Difference! Have you ever wondered, as I have, what makes this kind of difference in people’s lives? It isn’t always a native intelligence or talent or dedication. It isn’t that one person wants success and the other doesn’t. The difference lies in what each person knows and how he or she makes use of that knowledge. And that is why I am writing to you and to people like you about us. For that is the whole purpose of our website. To give its users – knowledge that they can use and thrive well beyond everyone else. It’s a website unlike any other. I think everything composed made a bunch of sense. However, what about this? mean A Bridge for the World – Peace Plan to the Israeli-Palestinian Conflict – Michael Ruark is a little plain. I love this site it’s a work of art! Delighted to uncover this on the internet. I wanna comment that you have a very nice site, I really like the style and design it certainly is different. This website is excellent, very excellent and packed with excellent written content. It’s remarkable in favor of me to have a web site, which is valuable in support of my experience. posts are excellent as well as hope there will be more soon. Hi! Wonderful stuff, remember to keep me posted any time you post something like this! Amazing article. I thank you for sharing it to us. need to…HaHa). You certainly put a new spin on a topic that has been written about for years. Israeli-Palestinian Conflict – Michael Ruark <Loved it! be updated regularly. It carries nice material. to and you are just too fantastic. I actually like what you have got here, really like what you’re saying and the best way by which you say it. Hello, its good post on the topic of media print, we all be familiar with media is a great source of information.
) I maintain such information a lot. I was seeking this certain information for a very lengthy time. litte more about this subject? I’d be very grateful if you could elaborate a bit further. I actually enjoyed the usual info a person supply in your visitors? day, because i like to learn more and more. It’s an awesome post in favor of all the online users; they will obtain advantage from it I am sure. I visit everyday a few sites and blogs to read articles or reviews, but this web site provides feature based articles. Thanks for finally talking about >A Bridge for the World – Peace Plan to the Israeli-Palestinian Conflict – Michael Ruark <Liked it! Wow, wonderful weblog layout! How lengthy have you been blogging for? you made blogging glance easy. The whole glance of your web site is magnificent, let alone the content! but after checking through several of the post I realized it’s unfamiliar with me. Anyhow,I’m definitely delighted Ifound it and I’ll bee book-marking and checking back often! Whats up! I understand this is definitely to some extent off-topic however, I had to reluctantly inquire. Does performing a well-established homepage much like yuour own home make a large amount of perform? I’m unique towards writing a blog even so perform create throughout my mag day by day. I’d care to create a blog page so we could express great encounter and even emotions and thoughts on the internet. Please make sure to inform me when you have just about any options or perhaps methods for latest aspiring blog writers. Thankyou! Your proposal, like all the others, do not call for no autonomy for Jews, so it can’t possibly be accepted by the Arabs.